Thomas Piketty (French: [tɔ.ma pi.kɛ.ti]; born 7 May 1971) is a French economist whose work focuses on wealth and income inequality. He is a professor (directeur d'études) at the School for Advanced Studies in the Social Sciences (EHESS), associate chair at the Paris School of Economics and Centennial professor at the International Inequalities Institute, which is part of the London School of Economics (LSE). Piketty is the author of the best-selling book Capital in the Twenty-First Century (2013), which emphasises the themes of his work on wealth concentrations and distribution over the past 250 years. The book argues that the rate of capital return in developed countries is persistently greater than the rate of economic growth, and that this will cause wealth inequality to increase in the future. To address this problem Piketty proposes redistribution through a progressive global tax on wealth. Piketty was born on 7 May 1971, in the Parisian suburb of Clichy, Hauts-de-Seine. His parents had been involved with a Trotskyist group and the May 1968 protests in Paris, but they had moved away from this political position before Piketty was born, and a visit to the Soviet Union in 1991 was enough to make him a firm "believe[r] in capitalism, private property, the market". Piketty gained an S-stream (scientific) Baccalauréat, and after taking scientific preparatory classes, he entered the École Normale Supérieure (ENS) at the age of 18, where he studied mathematics and economics. At the age of 22, Piketty was awarded his PhD for a thesis on wealth redistribution, which he wrote at the London School of Economics (LSE) and EHESS under Roger Guesnerie and winning the French Economics Association's award for the best thesis of the year. After earning his PhD, Piketty taught from 1993 to 1995 as an assistant professor in the Department of Economics at the Massachusetts Institute of Technology. In 1995, he joined the French National Centre for Scientific Research (CNRS) as a researcher, and in 2000 he became a professor (directeur d'études) at EHESS. Piketty won the 2002 prize for the best young economist in France, and according to a list dated 11 November 2003, he is a member of the scientific orientation board of the association À gauche, en Europe, founded by Michel Rocard and Dominique Strauss-Kahn. In 2006, Piketty became the first head of the Paris School of Economics, which he helped set up. He left after a few months to serve as an economic advisor to Socialist Party candidate Ségolène Royal during the French presidential campaign. Piketty resumed teaching at the EHESS and Paris School of Economics in 2007. Thomas Piketty was the partner of the politician Aurélie Filippetti. In 2009, she sued him for domestic violence. Thomas Piketty acknowledged the complaint and apologized, following which Aurélie Filipetti withdrew her complaint. 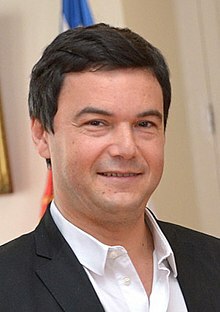 In April 2012, Piketty co-authored along with 42 colleagues an open letter in support of then socialist party candidate for the French presidency François Hollande. Hollande won the contest against the incumbent Nicolas Sarkozy in May of that year. Piketty was unimpressed by Hollande's tenure, later describing him as "hopeless". In January 2015, he rejected the French Legion of Honour order, stating that he refused the nomination because he did not think it was the government's role to decide who is honourable. On 27 September 2015, it was announced that he had been appointed to the British Labour Party's Economic Advisory Committee, convened by Shadow Chancellor John McDonnell and reporting to Labour Party Leader Jeremy Corbyn. The appointment of Piketty, who had previously advised Lord Wood, key policy advisor to former Labour Party Leader Ed Miliband, that tax rates could be raised above 50% for earnings over one million pounds without it impacting the economy, was seen as a particular coup for the Labour Party leadership due to his breakthrough success in the mainstream publishing world. Regarding this appointment he stated that he was very happy to take part and assist the Labour Party in constructing an economic policy that helps tackle some of the biggest issues facing people in the UK and that there was a brilliant opportunity for the Labour party to construct a fresh and new political economy which will expose austerity for the failure it has been in the UK and Europe, although he reportedly failed to attend the first meeting. In June 2016, he resigned from his role in Labour's Economic Advisory Committee, citing concerns over the weak campaign the party had run in the EU referendum. On 2 October 2015 Piketty received an honorary doctorate from the University of Johannesburg and on 3 October 2015 he delivered the 13th Annual Nelson Mandela Lecture at the University of Johannesburg. On 11 February 2017, it was announced that he had joined the socialist Benoît Hamon's campaign team in the latter's presidential run. He took in charge of EU matters, and more precisely, the Fiscal Stability Treaty (or TSCG), while Julia Cagé was responsible for the candidate's economic and fiscal platform. Piketty expressed his view that the TSCG should be renegotiated in order to introduce a euro zone assembly, composed of members of EU's parliaments — a "democratic government", he said, in comparison with the current system which he views as a "huis clos". Such change would currently require a unanimous approval of all EU members, and Piketty has suggested that a change of rules might be necessary, saying that if countries representing 80% of EU's population or GDP ratify a treaty, it should be approved. He is also in favour of a "credible and bold basic income", which is one of Benoit Hamon's key proposals, although their views on the matter are different. The call in which Piketty and other economic researchers argue for their version of the basic income has been criticised as not "universal", a criticism he answered on his blog. Thomas Piketty joined the London School of Economics (LSE) in 2015 as the distinguished Centennial Professor. Piketty continues his research as part of the LSE International Inequalities Institute. His economic research focusses mainly on wealth inequalities and the use of capital in the 21st century. Piketty has long-standing ties to the London School of Economics and he completed his PhD studies at the university in the early 1990s. In addition to his research, Piketty also teaches post-graduate students at the LSE. His teaching and research approach is inter-disciplinary and he has been involved in the teaching of the new MSc degree in Inequalities and Social Science at the London School of Economics. Piketty specializes in economic inequality, taking a historic and statistical approach. His work looks at the rate of capital accumulation in relation to economic growth over a two hundred year spread from the nineteenth century to the present. His novel use of tax records enabled him to gather data on the very top economic elite, who had previously been understudied, and to ascertain their rate of accumulation of wealth and how this compared to the rest of society and economy. His most recent book, Capital in the Twenty-First Century, relies on economic data going back 250 years to show that an ever-rising concentration of wealth is not self-correcting. To address this problem, he proposes redistribution through a progressive global tax on wealth. A research project on high incomes in France led to the book Les hauts revenus en France au XXe (High incomes in France in the 20th Century, Grasset, 2001), which was based on a survey of statistical series covering the whole of the 20th century, built from data from the fiscal services (particularly income tax declarations). He extended this analysis in his immensely popular book Le Capital au XXIe siècle (Capital in the Twenty-First Century). A study by Emmanuel Saez and Piketty showed that the top 10 percent of earners took more than half of the country's total income in 2012, the highest level recorded since the government began collecting the relevant data a century ago. Piketty's work shows that differences in earnings dropped sharply during the 20th century in France, mostly after World War II. He argues that this was due to a decrease in estate inequalities, while wage inequalities remained stable. The shrinking inequality during this period, Piketty says, resulted from a highly progressive income tax after the war, which upset the dynamics of estate accumulation by reducing the surplus money available for saving by the wealthiest. The normative conclusion Piketty draws is that a tax cut and thus a decrease in the financial contribution to society of the wealthy that has been happening in France since the late 1990s will assist in the rebuilding of the earlier large fortunes of the rentier class. This trend will lead to the rise of what he calls patrimonial capitalism, in which a few families control most of the wealth. Through a statistical survey, Piketty also showed that the Laffer effect, which claims that high marginal tax rates on top incomes are an incentive for the rich to work less, was probably negligible in the case of France. Piketty's work has been discussed as a critical continuation of the pioneering work of Simon Kuznets in the 1950s. According to Kuznets, the long-term evolution of earnings inequalities was shaped as a curve (Kuznets curve). Growth started at the beginning of the industrial revolution, and slackened off later due to the reallocation of the labor force from low productivity sectors like agriculture to higher productivity sectors like industry. According to Piketty, the tendency observed by Kuznets in the early 1950s is not necessarily a product of deep economic forces (e.g. sectoral spillover or the effects of technological progress). Instead, estate values, rather than wage inequalities, decreased, and they did so for reasons that were not specifically economic (for example, the creation of income tax). Consequently, the decrease would not necessarily continue, and in fact, inequalities have grown sharply in the United States over the last thirty years, returning to their 1930s level. Besides these surveys, which make up the core of his work, Piketty has published in other areas, often with a connection to economic inequalities. His work on schools, for example, postulates that disparities among different schools, especially class sizes, is a cause for the persistence of inequalities in wages and the economy. He has also published proposals for changes in the French pension system and the French tax system. In a 2018 paper, Piketty suggested that throughout the Western world, political parties of both the left and the right have been captured by the "elites." Capital in the Twenty-First Century, published in 2013, focuses on wealth and income inequality in Europe and the US since the 18th century. The book's central thesis is that inequality is not an accident but rather a feature of capitalism that can be reversed only through state intervention. The book thus argues that unless capitalism is reformed, the very democratic order will be threatened. The book reached number one on The New York Times bestselling hardcover nonfiction list from 18 May 2014. Piketty offered a "possible remedy: a global tax on wealth." In 2014, he was awarded the British Academy Medal for this book. He is married to fellow economist Julia Cagé. ^ "Thomas Piketty - Paris School of Economics". PSE - Ecole d'économie de Paris - Paris School of Economics. Retrieved 16 December 2017. ^ Piketty, Thomas. "CV". Retrieved 1 May 2014. ^ "Thomas Piketty joins LSE as Centennial Professor". London School of Economics and Political Science. Retrieved 16 May 2015. ^ "Paris School of Economics". Archived from the original on 9 May 2014. Retrieved 19 May 2014. ^ a b Krugman, Paul (8 May 2014). "Why We're in a New Gilded Age". The New York Review of Books. ^ Tanenhaus, Sam (25 April 2014). "Hey, Big Thinker: Thomas Piketty, the Economist Behind 'Capital in the Twenty-First Century' Is the Latest Overnight Intellectual Sensation". New York Times. Retrieved 26 April 2014. ^ a b Chassany, Anne-Sylvaine (26 June 2015). "Lunch with the FT: Thomas Piketty". ft.com. Retrieved 26 June 2015. ^ a b "Curriculum vitae". pse.ens.fr. Retrieved 11 January 2014. ^ a b John Cassidy, "Forces of Divergence", The New Yorker, 31 March 2014. ^ Gobry, Pascal-Emmanuel (22 May 2014). "Thomas Piketty, a Not-So-Radical French Thinker". The Wall Street Journal. Retrieved 8 December 2014. ^ "Thomas Piketty / France Inter". Franceinter.fr. 20 October 2013. Retrieved 16 June 2014. ^ Annie Kahn and Virginie Malingre (22 February 2007). "Les " French economists " font école". Le Monde. Retrieved 28 September 2010. ^ "Avant qu'il ne soit trop tard". Nouvel Observateur. 3 March 2007. Retrieved 28 September 2010. ^ "Thomas Piketty". Paris School of Economics. Retrieved 13 March 2014. ^ "Plainte Filippetti / Piketty : domaine public ?". Arretsurimages.net. Retrieved 16 December 2017. ^ "" Nous, économistes, soutenons François Hollande " 17 Apr 2012". lemonde.fr. 17 April 2012. Retrieved 16 June 2014. ^ "Yrjö Jahnsson Award in Economics". Yrjö Jahnsson Foundation. ^ "Piketty rejects Légion d'Honneur award". Financial Times. ^ "BBC News – France economist Thomas Piketty rejects Legion D'Honneur". BBC News. 1 January 2015. ^ a b "Labour announces new Economic Advisory Committee". Labour Press. 27 September 2015. Retrieved 11 March 2016. ^ Andrew Sparrow, Thomas Piketty interviewed by Stewart Wood: Politics live blog, The Guardian, 16 June 2014. ^ Williams-Grut, Oscar (28 September 2015). "Meet the team shaping the Labour Party's 'New Economics'". Business Insider. Retrieved 11 March 2016. ^ "Jeremy Corbyn's economic advisor Thomas Piketty resigns". Independent.co.uk. 29 June 2016. Retrieved 16 December 2017. ^ "Transcript of Nelson Mandela Annual Lecture 2015". The Nelson Mandela Foundation. 3 October 2015. Retrieved 23 December 2015. ^ Boudet, Alexandre (12 February 2017). "À quoi ressemble l'Europe de Benoît Hamon version Thomas Piketty". Le Huffington Post (in French). Retrieved 13 March 2017. ^ Piketty, Thomas (13 February 2017). "For a credible and bold basic income". Le blog de Thomas Piketty. Retrieved 13 March 2017. ^ Piketty, Thomas (13 February 2017). "Is our basic income really universal?". Le blog de Thomas Piketty. Retrieved 13 March 2017. ^ Daniel Henninger (12 March 2009). "The Obama Rosetta Stone". The Wall Street Journal. Archived from the original on 17 May 2009. Retrieved 28 September 2010. ^ See in particular his Introduction à la théorie de la redistribution des richesses, Economica, 1994. ^ Lowrey, Annie (10 September 2013). "The Rich Get Richer Through the Recovery". The New York Times. ^ Tanner, Michael (28 January 2014). "The president's 'inequality' absurdities". New York Post. ^ Emmanuel Saez (September 3, 2013). "Striking it Richer : The Evolution of Top Incomes in the United States (Updated with 2012 preliminary estimates)" (PDF). Eml.berkeley.edu. Retrieved 16 December 2017. ^ "Les Hauts revenus face aux modifications des taux marginaux supérieurs de l'impôt sur le revenu en France, 1970–1996" (PDF). Économie et prévision, n° 138–139. 1999. ^ Piketty, T.; Saez, E. (2003). "Income Inequality in the United States, 1913-1998" (PDF). The Quarterly Journal of Economics. 118: 1. doi:10.1162/00335530360535135. ^ See particularly, Piketty, T.; Saez, E. (2006). "The Evolution of Top Incomes: A Historical and International Perspective". American Economic Review. 96 (2): 200–205. doi:10.1257/000282806777212116. JSTOR 30034642. And Atkinston, T.; Piketty, T., eds. (2007). Top incomes over the twentieth century : a contrast between continental European and English-speaking countries. Oxford University Press. ^ "Emmanuel Saez, Clark Medalist 2009". aeaweb.org. Retrieved 2018-02-07. ^ "The Kuznets' curve, yesterday and tomorrow", in A. Banerjee, R. Benabou et D. Mookerhee (eds. ), Understanding poverty, Oxford university press, 2005. ^ T. Piketty and M. Valdenaire, L'impact de la taille des classes sur la réussite scolaire dans les écoles, collèges et lycées français – Estimations à partir du panel primaire 1997 et du panel secondaire 1995, Ministère de l'éducation nationale, 2006. ^ A. Bozio and T. Piketty, Pour un nouveau système de retraite : des comptes individuels de cotisations financés par répartition, Edition de l'ENS rue d'Ulm, collection du CEPREMAP n°14, 2008. ^ Spencer, Keith (March 27, 2018). "Thomas Piketty says Bernie Sanders' electoral strategy is the way to beat back the right". Salon. Retrieved March 28, 2018. ^ a b Ryan Cooper (25 March 2014). "Why everyone is talking about Thomas Piketty's Capital in the Twenty-First Century". The Week. ^ Cowles, Gregory. "Best Sellers". The New York Times. Retrieved 22 May 2014. Wikimedia Commons has media related to Thomas Piketty. Thomas Piketty, personal page at the website of the Paris School of Economics. WATCH: Elizabeth Warren And Thomas Piketty Discuss Nature, Causes Of Economic Inequality. The Huffington Post, 2 June 2014. Taking On Adam Smith (and Karl Marx), New York Times, 19 April 2014. Roberts, Russ (September 22, 2014). "Thomas Piketty on Inequality and Capital in the 21st Century". EconTalk. Library of Economics and Liberty. Piketty calls out GOP hypocrisy on inequality. MSNBC, 11 March 2015. Austerity Has Failed: An Open Letter From Thomas Piketty to Angela Merkel. The Nation, 7 July 2015. We must rethink globalization, or Trumpism will prevail. Thomas Piketty via The Guardian. 16 November 2016.